Explore gun improvements as we climb the branches of one of the primary weapon trees. Every weapon in Battlefield™ V has been created with a simple design philosophy. Weapons should all be balanced, uniquely different, fun to use, and give beginners and pros something to learn or master. This goes for Specializations, too. If you haven’t heard of these, they’re a way to improve your primary weapons with various perks. By using your weapons in battle, and spending the in-game currency Company Coin you earn from doing so, you’ll unlock Specializations. From the very first unlock, you get to choose their flavor. Every choice has its pros and cons, so choose wisely as you climb the Specialization trees. Each weapon is a journey in itself, and you will plot its course. Not only will Specializations teach you how to handle different weapons. When mastered, you can go back and try different setups, and take on new challenges. Note that if you’re new to Battlefield V, Specializations should never make you feel that you’re at a disadvantage compared to seasoned players. That’s why the four starter weapons (one per class) have Specializations unlocked from the get-go. These starter weapons will initially be on Rank 0. At Rank 4, you can go back and re-spec them as you see fit. Just as visual customization does not change how a weapon performs, most Specializations don’t change how the weapon looks – but there are exceptions to the latter. For example, if you add the Extended Magazine Specialization to the Suomi KP/-31, a larger magazine will be added to the weapon for you and everyone else on the battlefield to see. There are Specializations for vehicles, too – read our article about how to specialize an iconic tank. In games like Battlefield™ 3 and Battlefield™ 4, there were quite a lot of ways to adjust values to your weapons through various attachments. This time, we’re going for quality over quantity. Specializations will be fewer but better and more intuitive to understand. It’s our goal to give each weapon as much character and depth as we can. Battlefield 4 only had two or three optimal configurations of weapons, which meant you saw players fighting with the same foregrip and other attachments. After listening to the community, we separated the vanity aspect from the gameplay aspect for these weapon-altering choices. 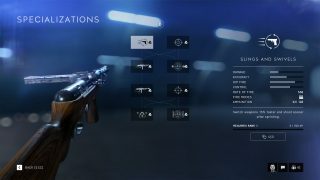 This means that in Battlefield V, you can have a fully specialized weapon that is not tied to a certain visual look. To exemplify how the Specialization system works, let’s look at a specific weapon: the EMP. If you’ve read our article listing all weapons, vehicles, and gadgets coming to Battlefield V at launch, you’ll know that the EMP belongs to the Submachine Guns, a weapon category heavily specialized into close-range fights. As the image above demonstrates, the EMP has eight different Specializations and eight paths to get through the Specialization tree, just like the game’s other primary weapons. Battlefield V Open Beta participants may remember that there were only four paths through the tree; we increased this to provide more choice. As is the case with most Battlefield V weapons, the four Specializations on the left side will buff your EMP mainly for close-range situations – this means improvements to hip fire and rate of fire. The four Specializations on the image’s right side will improve your weapon mainly when it comes to medium and long-range situations, meaning less recoil and improved aim down the sights. It’s up to you if you want to go all-in on one side or get a little from both column A and B. Each choice comes with upsides but sometimes downsides as well – and choosing one of two Specializations of course means not getting the benefits of the other. Effects will be visualized in the meters for damage, accuracy, hip fire, and more. Let’s start with the four Specializations on the left side of the EMP tree. Slings and Swivels: Allows swapping to your EMP or sidearm faster. This comes in handy when, for instance, you’re in a firefight and you don’t have time to reload your EMP. Swap to your sidearm in 0.65 instead of 0.75 seconds and win the fight. You’ll also shoot sooner after sprinting. Enhanced Grips: This improves your base accuracy when firing from the hip. Unlock this and get 25% less hip fire-related spread and 33% better range. Polished Action: Decreases hip fire inaccuracy and makes your EMP stay accurate for a bit longer. You’ll get around 40% less inaccuracy from hip firing with this unlocked. Recoil Buffer: Keep your EMP steady with this Specialization. It reduces vertical recoil by 20%. Moving on to the right side of the tree, you’ll find these Specializations tied to aiming down the sights (also known as ADS). Quick Aim: Makes your EMP zoom in faster when going into ADS. Instead of 200ms, it will take 133ms to line up your weapon. Custom Stock: Stay on target. This Specialization reduces spread by 33% while moving aiming down the sights. Lightened Stock: Peak around corners more quickly while aiming. In your ADS view, you’ll move 60% quicker with this one. Barrel Bedding: Reduces spread by 75% for ADS. Use it to get an extra headshot or two and enjoy the slightly longer sustained fire. The Specialization trees are a way to teach you the ins-and-outs of weapons, but what happens after you’ve made your way through the tree and mastered your weapon? Fortunately, there is more to do. You can re-spec your weapon, taking a new path through the options to discover new variations for new situations. You also have the opportunity to take on weapon-specific Special Assignments, introduced when the Specialization tree is completed. Complete these in-game challenges, and you’ll unlock stunning, unique vanity items for your weapon. Master these chained challenges; the end goal is truly golden . . .